In a recent survey of HR professionals, over 57% of respondents shared that digital credentials will supplement or replace resumes as part of a job application process. Organizations that issue credentials — such as diplomas, licenses, professional certificates, and competencies — need to ensure their credentials carry the TrueCred® mark to create a unique digitally signed credential that is portable, verifiable and secure. Our technology is the first standards-based solution for creating tamper-proof digital credentials called TrueCred®. With its unique API technology, our solution creates a credential that is digitally signed and ensures owners and verifiers proof of a credential’s authenticity, who issued it, and to whom it belongs. Trust only TrueCred®. Our solution is licensed to application developers who create decision-making tools for issuers, recipients, observers, and owners of digital credentials. 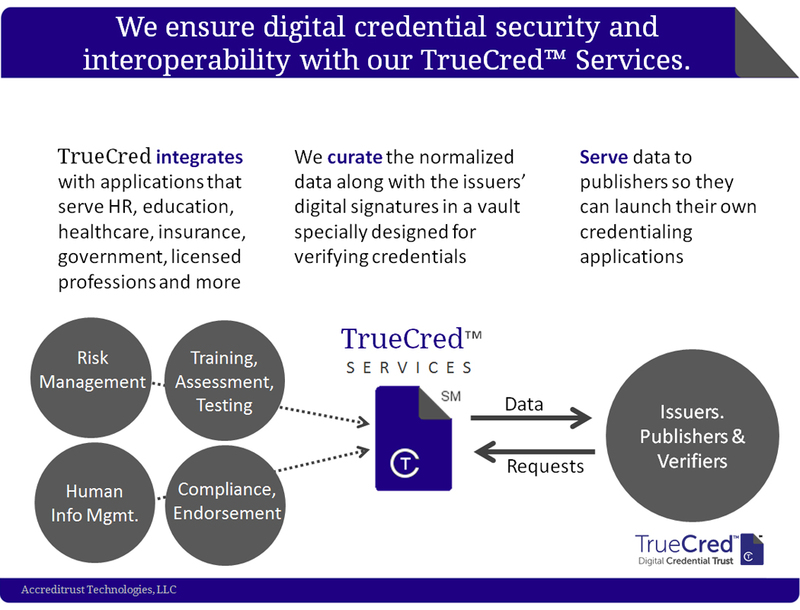 Sustainable – TrueCred® digital credentials are usable over a lifetime with open standards for interoperability. Interoperable – Easily exchange data between disparate systems with TrueCred®. Portable – Have the freedom to move TrueCred® digital credentials from one identity provider to another while keeping security and inoperability. Verifiable – Independently and easily evaluate a digital credential’s signature for data authenticity proving who issued it, and to whom it belongs when it is TrueCred®. Extensible – Issue digital credentials that meet current and future use cases utilizing a flexible data model when you create TrueCred®. Secure – Ensures digital credentials are tamper-proof and trustworthy with data cryptography and communication by leveraging TrueCred®.